Join us for a perfect day of free fun by the river! We call it the Greatest Show (& Tell) on Earth—a family-friendly showcase of invention, creativity, and resourcefulness. Great food and beer, robots, makers, art, and more. Did we mention we'll have a roving Dr. Who Dalek and a fire-breathing unicorn?! Free parking will be available throughout downtown North Little Rock. Guests with disabilities will have access to parking in the North Shore parking lot. Find your public transportation route through bus or River Rail at http://www.rrmetro.org/. Yes! We will have ample parking for bikes. Please bring your own lock. For the safety and well being of our four-legged friends, please leave your pets at home. There are loud noises, many moveable parts, fire elements, and large crowds, all of which do not create a safe environment for pets. Yes. 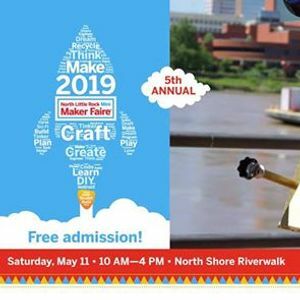 We welcome volunteer participation at North Little Rock Mini Maker Faire. We believe our volunteers make a valuable contribution to the success of the Faire! 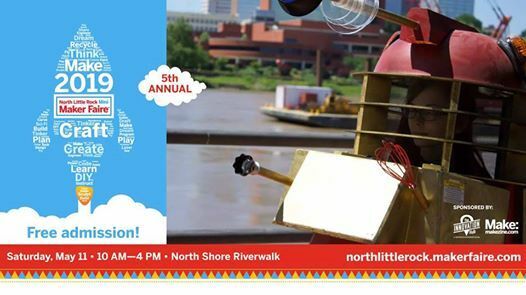 Learn more about the volunteer positions and contribute to the success of North Little Rock Mini Maker Faire. Just message our Facebook page.